The legendary A-Musik record store has been at the heart of Cologne’s left of center and experimental music scene ever since it was founded in 1995 by Georg Odijk. A-Musik has also always operated as a record distributor and label. It is difficult to trace A-Musik’s importance and influence, but a quick glance at some of its associates and achievements over the years may be enlightening. As a label, A-Musik has released music by Marcus Schmickler, Felix Kubin, Schlammpeitziger, Lithops, F.S.K., F.X. Randomiz, Terre Thaemlitz and many more. As a distributor, A-Musik works with labels such as 12K, Black Truffle Records, Binemusic, Dekorder, Editions Mego, Die Schachtel, Klangbad, Raster-Noton, Vinyl-On-Demand, some 100 labels in total. Many of the people working for A-Musik are active producing and performing music, running labels and organizing or co-organizing experimental music events in and around Cologne. 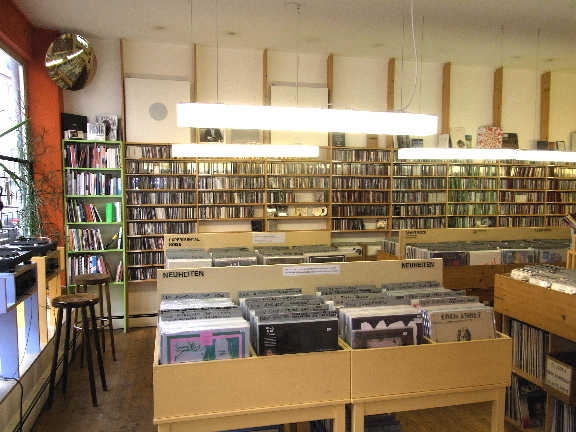 The congenial atmosphere and amazing offer of the A-Musik record store have always made the store a point of reference for music lovers in Cologne and beyond. It is in effect one of the quintessential record stores for experimental music in Europe. For the full duration of the festival, A-Musik will be selling records, offering their typically wide-ranging and eclectic selection on top of releases from artists performing at the festival as well.